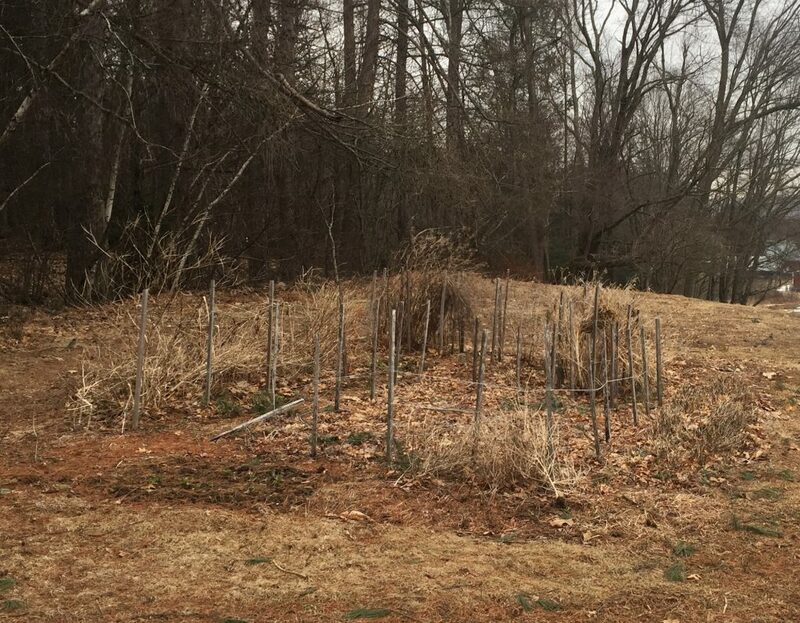 That morning I pulled up the dead marigolds (bed furthest to right) and orange cosmos (bed furthest to the left). 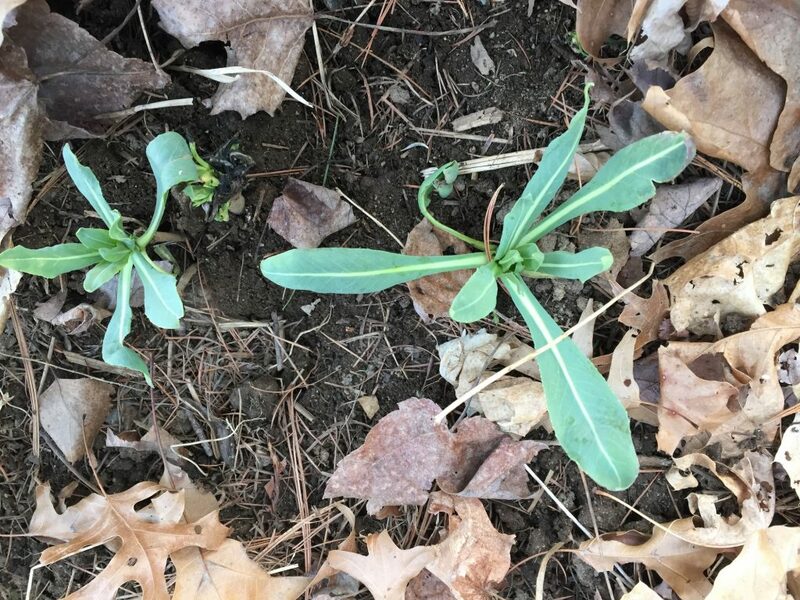 The woad was up, but something had been nibbling it. I suspect rabbits, but I can’t be sure. I didn’t get back over there until March 30th. I cut down the amsonia, which I grow because it is a bast fiber plant. Some years I cut it down earlier in the fall or winter, but this fall I obviously didn’t get around to it. 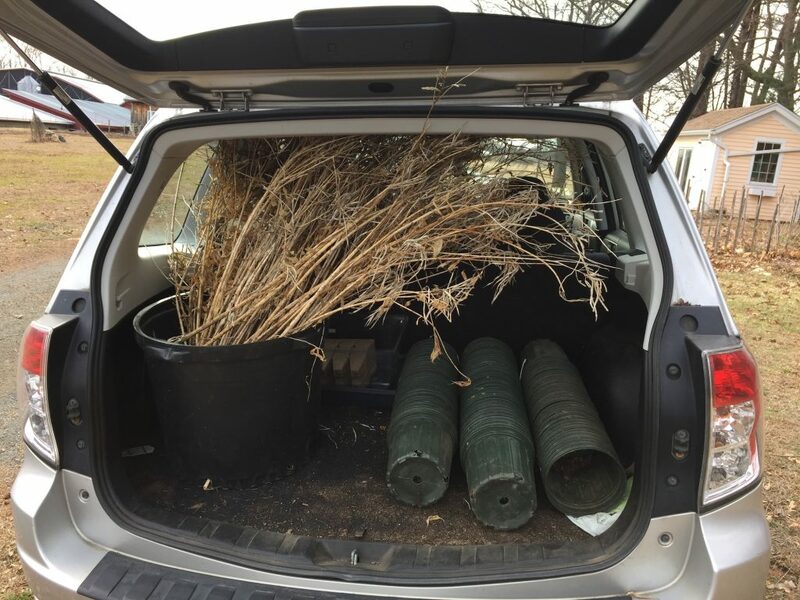 Yay, the Amsonia fit in the back of the car. Barely! I also cut down the dead bronze fennel, which was not worth saving at that point. 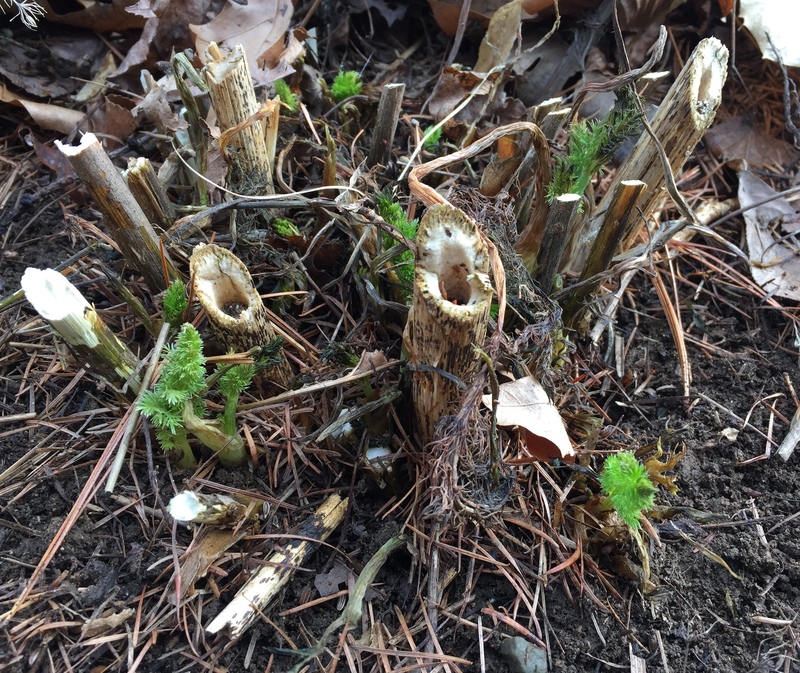 Once I cut away the dead stalks and cleared away the fallen leaves, I was excited to see that there was already new growth! 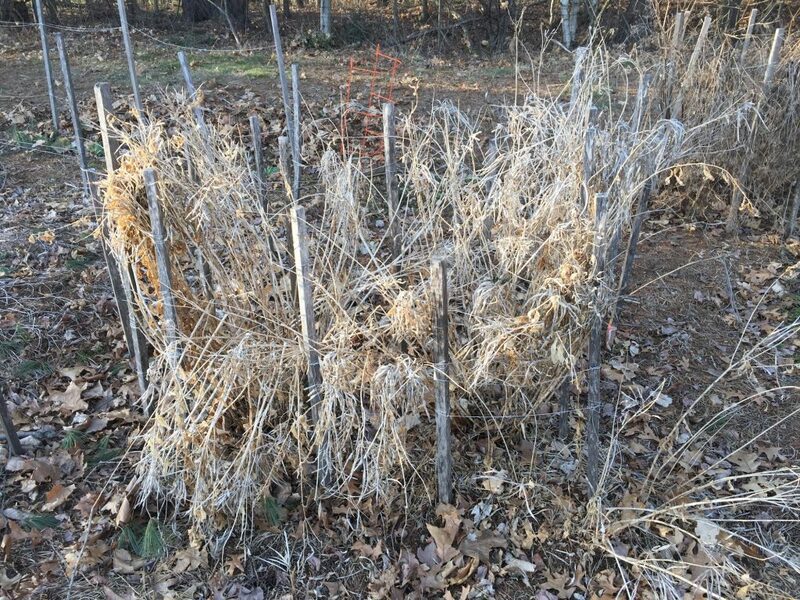 If you bought some of the bronze fennel plants at my plant sale last summer at Sheep and Shawl, check to see if they’re up! One of the things I love about gardening and dyeing with plants is the way that it requires me to look closely and be attentive. 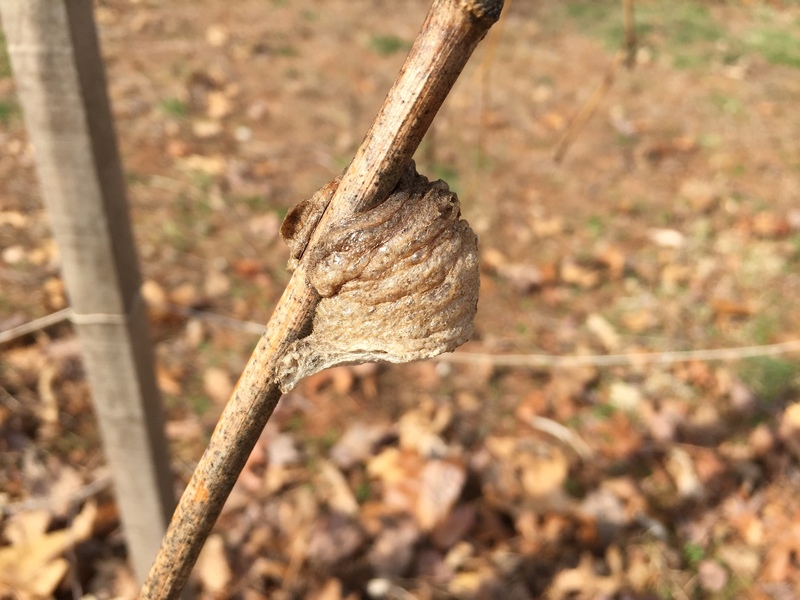 Close up, you can clearly see the new growth. It is eye-poppingly bright and practically shouting its presence. 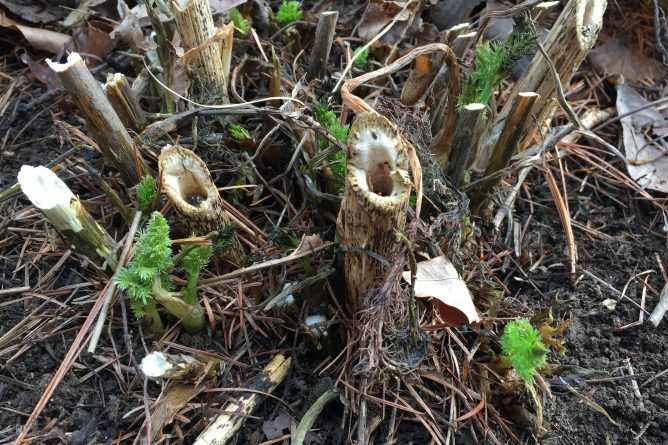 You can also see the architectural ruins of the old stalks, some darker blotches on the fresh fronds, which I think must be frost damage, and so many other intriguing details. At every stage of its growth, the fronds of the bronze fennel are just so soft and feathery. I will be teaching four craft, weaving, and fiber arts camps for kids this summer at the Common School. Registration is open now for Summerfun 2019. You can see the descriptions on the Common School website. For teachers of young children, I will be doing a workshop on growing and using dye plants on June 8th, 2019 at Antioch University’s In Bloom conference here in Amherst, MA. I’m excited to be able to offer this workshop on location at the Common School, where we can walk over to the farm to see the dyeplant garden while the dyepots are steeping at school. More information is available on the Antioch University website. 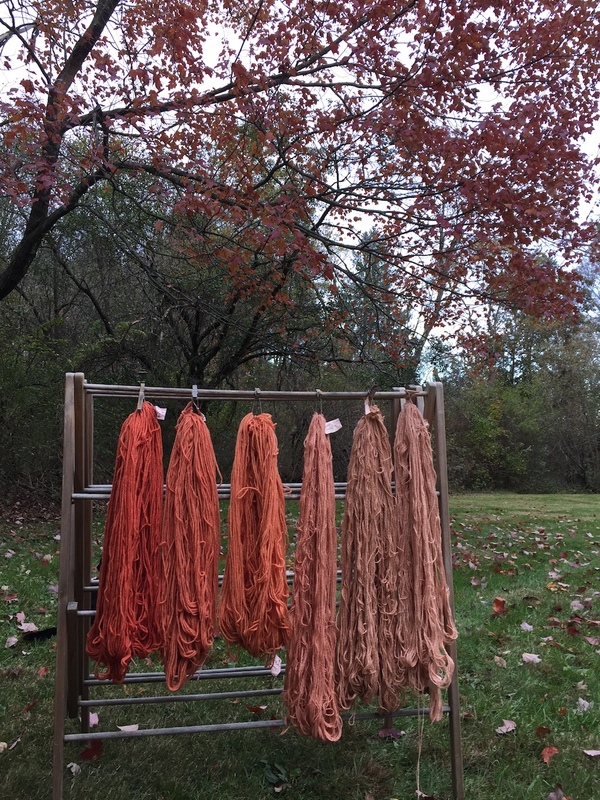 Here are some images of yarns we dyed with my class at the Common School this winter, using dried marigolds, frozen orange cosmos flowers, and dried bronze fennel. We made them as part of our “Senses” study. 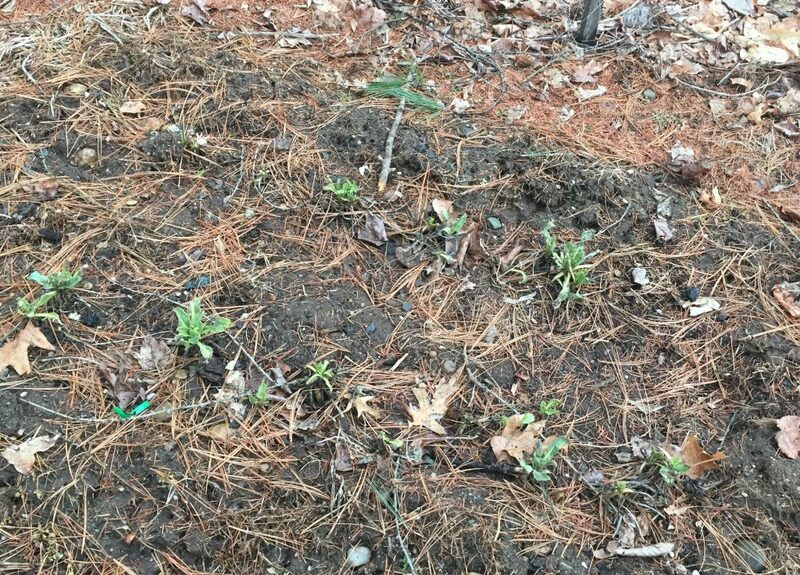 Students helped to collect the flowers earlier in the fall, and sprouted some bronze fennel seedlings of their own to take home. This project engaged our sense of smell as well as our sense of sight. If you are neither a child nor a teacher of children, never fear. There will be more Local Color Dyes events to come in 2019. I will keep you posted! I have finally exhausted all the dye baths from Farm Aid! 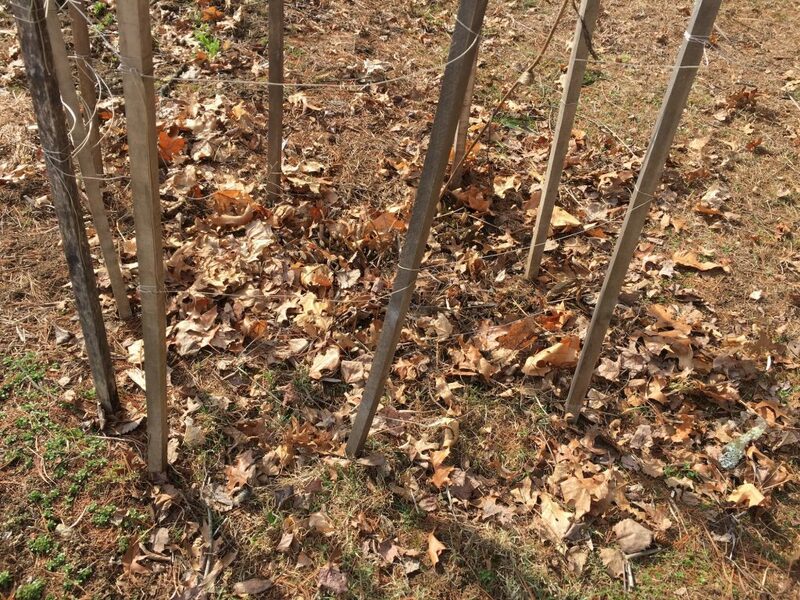 Here are some photos of the process, plus some of the ratios and measurements for each plant material. I didn’t keep close track of the times and temperatures during the demo itself because it was so busy. Each bath with the plant material heated for at least an hour, and some of them heated for longer. As I mentioned in the first post, I used madder root, weld, orange cosmos, and marigolds. All the yarns at the demo were 4 ounces of 4-ply wool. They were pre-mordanted with aluminum sulfate at 1 tablespoon per 4 oz. fiber, and cream of tartar at 1 teaspoon per 4 oz. fiber. As I got further along with the exhaust process, I switched to alpaca yarns, pre-mordanted at the same ratios. All the exhaust baths were heated to about 140-160 degrees, kept at that temperature for an hour, then cooled overnight. 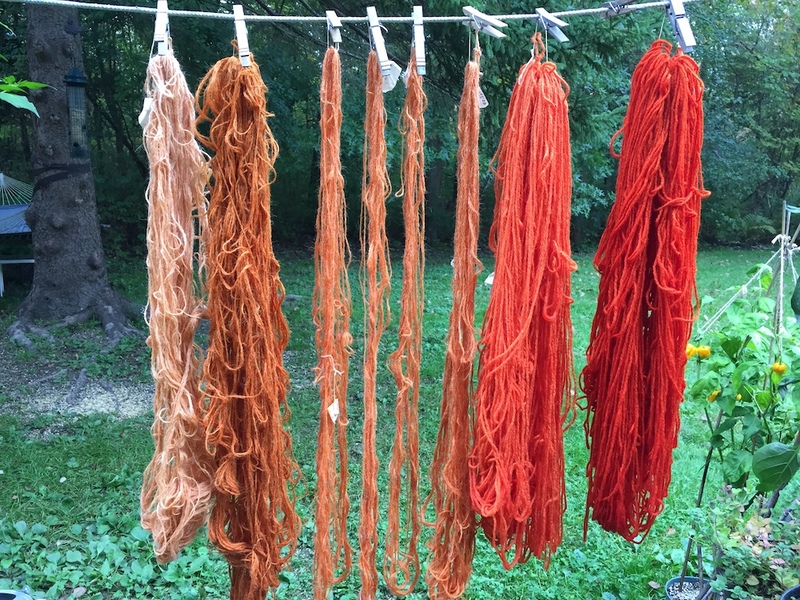 Madder: I used 10 ounces of chopped, dried madder root to make the dye bath. 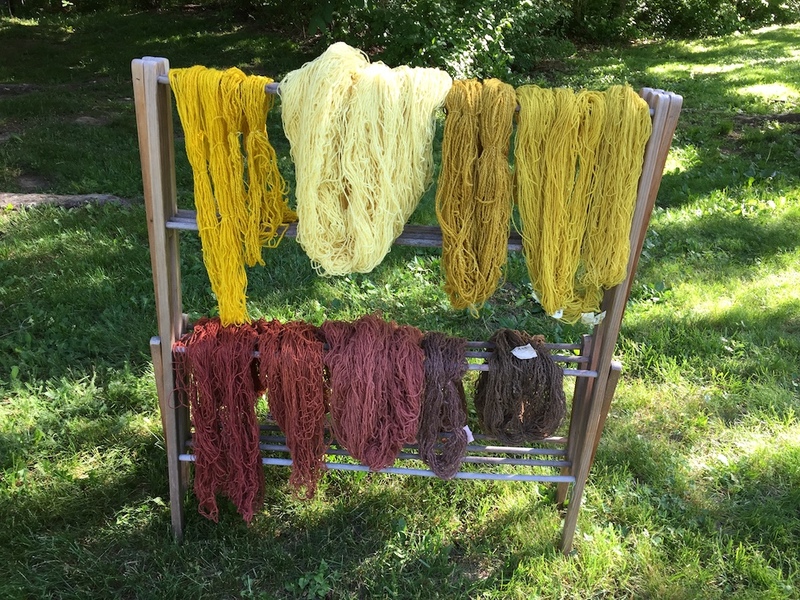 Some was from Aurora Silk, some was from my mom’s place in New Hampshire, and some was from my school’s dye and fiber plant garden at Bramble Hill Farm in Amherst, MA. Before the demo, I soaked the roots for 24 hours in about a gallon of water, with a teaspoon of calcium carbonate and a teaspoon of soda ash. The day before the demo I did the first extraction of the roots, heating them up to about 160 degree, maintaining that for about an hour, and then letting them steep overnight. The temperature accidentally got up to 200 degrees for a short time. I extracted the roots a second time at the demo in another gallon of water, then combined the two dye baths. Weld: I used 8 ounces of weld to make the dye bath. The weld was from the dye plant garden at Bramble Hill Farm. It was dried and chopped up. I didn’t soak it ahead of time, but I did extract the plant material twice during the demo. I didn’t put in any soda ash or chalk at first, so the color didn’t bloom until after I strained out the plant material and adjusted the chemistry. After that, I kept the pH around 8. Orange Cosmos: I used about 16 oz. frozen orange cosmos from our community garden plot at Amethyst Brook and the Bramble Hill garden. I kept the flowers frozen until right before I put them into the pot of water. After I extracted the flowers, I added soda ash to keep the bath around pH8. Marigolds: I used 6 ounces of dried marigolds picked at our CSA, Next Barn Over, in Hadley, MA. I don’t know the variety, but they were huge and eye-poppingly bright! I didn’t adjust the pH or use other additives. 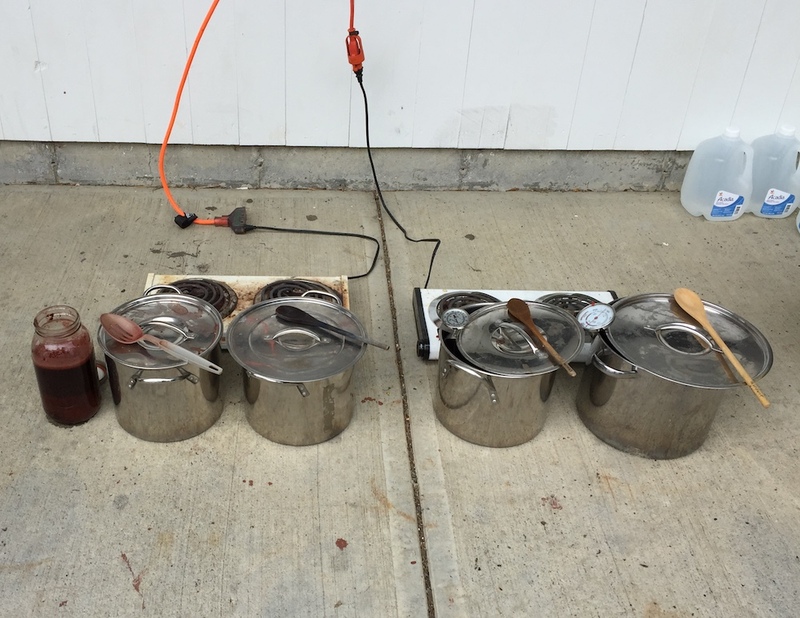 Here are four exhaust dye baths on the stove on September 24th, two days after the event. All of these skeins are the 4-ply wool mill ends from Webs that I used at the demo. For the orange cosmos baths, I kept the pH up around pH 8-9 by adding soda ash solution, which contributed to the surprising redness. It was also a really strong bath! 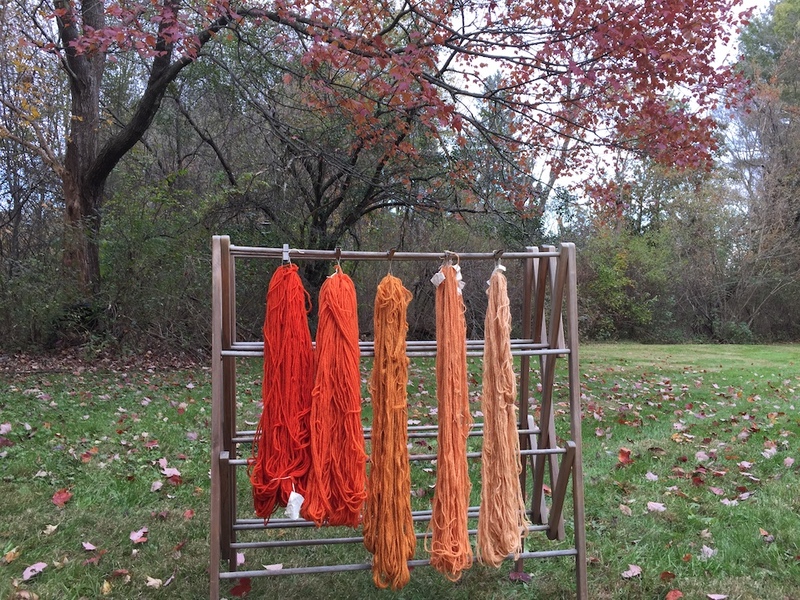 Here are all the orange cosmos skeins dripping and drying outside. They are really vivid because they are still wet in this picture. Fiber is always lighter when it dries. I always do a delayed rinse on my fiber, which means that after I pull a skein out of the dye bath, I wait until it’s dry to wash and rinse it. The two on the right, above, are wool. The one on the far right went into the strongest dye bath. The one second from the right was the first exhaust bath. The thinner skeins from the middle to left hand side are alpaca fiber. In this photo, I hung the skeins slightly out of order. The larger, more orangey skein second from the left was the third in the sequence, and the teensy ones in the middle were, in fact, in the fourth bath. The pale pinkish one on the far left was last. 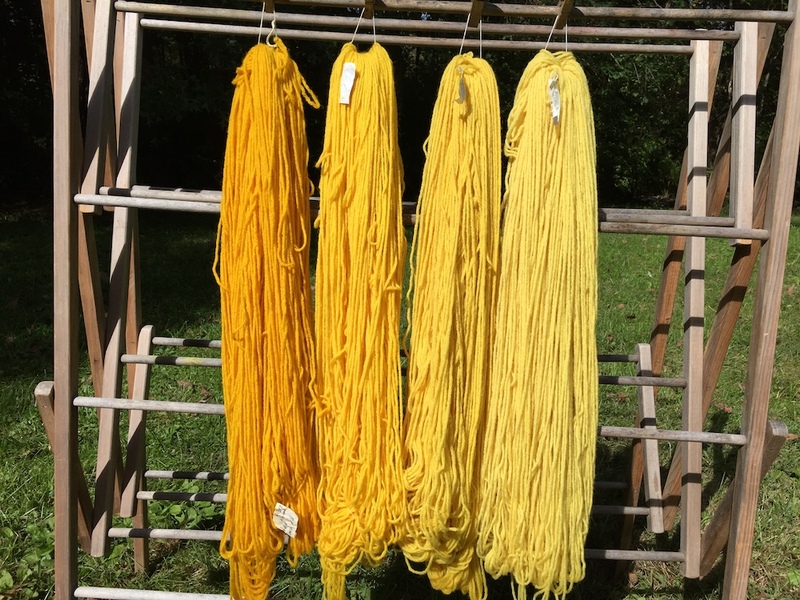 The three skeins on the left, above, are 4-ply wool, hung in the order in which they were dyed, strongest bath to weakest. The thinner skeins on the right are alpaca. 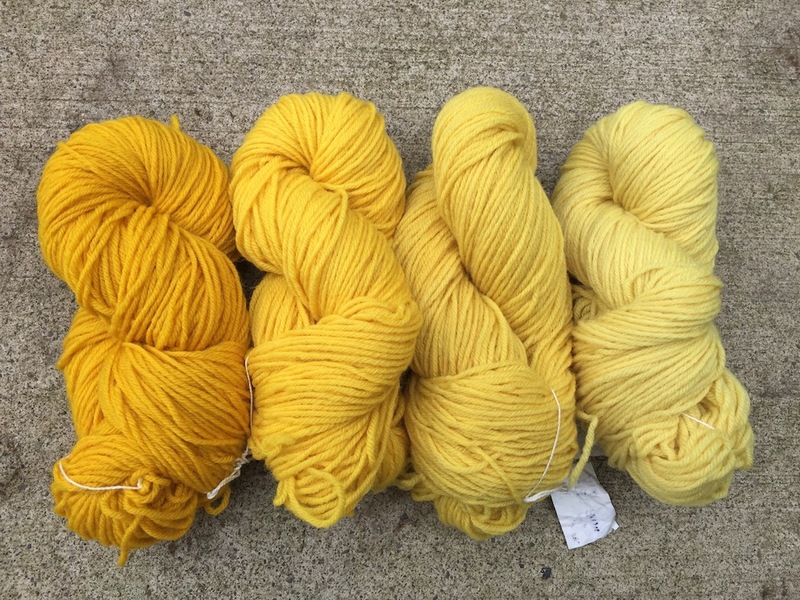 The three woolen skeins together weigh 12oz., and the alpaca all together weigh 16 oz. Again, the skeins on the left are wool, and the skeins on the right are alpaca. The two woolen skeins together weight 8 oz. 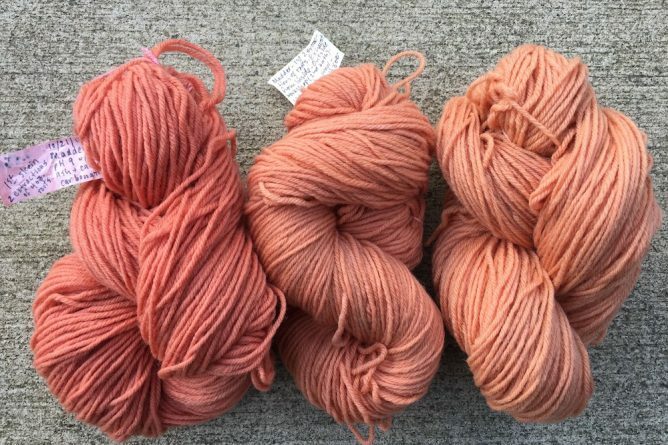 the alpaca skeins together weigh 12 oz. 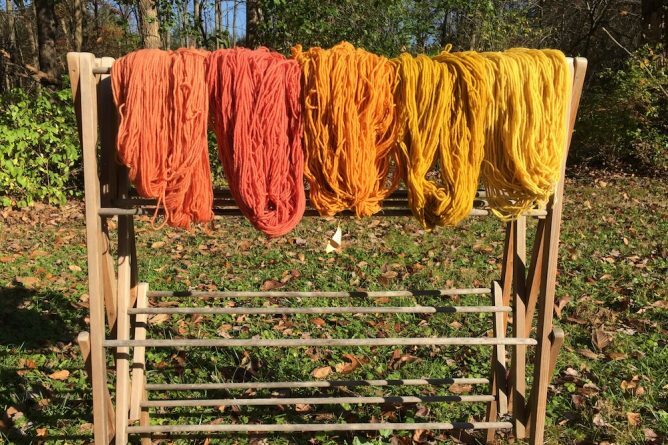 Here are the madder, cosmos, and marigolds skeins hanging all together on October 20th. I liked the way the skeins echoed the color in the trees, so I didn’t include the weld skeins. 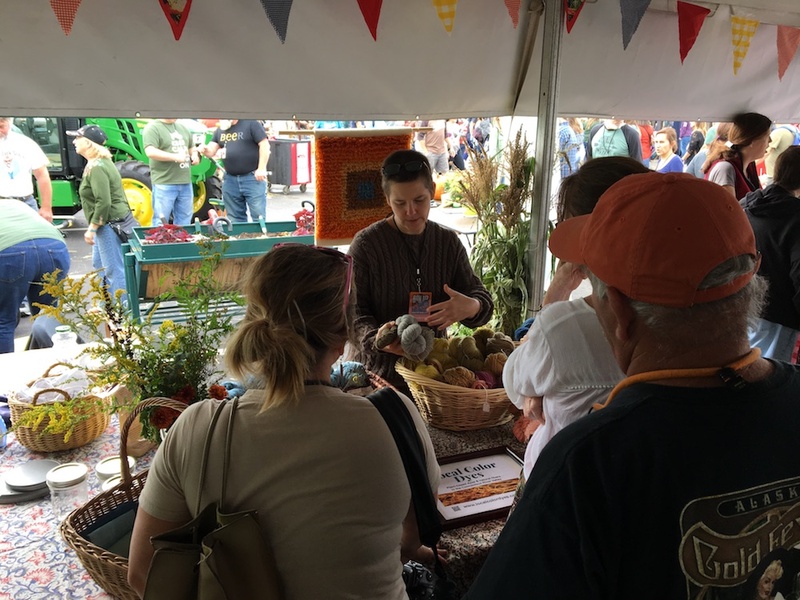 On Saturday September 22nd I did a natural dyeing demo at Farm Aid 2018 in Hartford, CT. Yes, Farm Aid, as in Willie Nelson, Neil Young, John Mellencamp, and Dave Matthews. 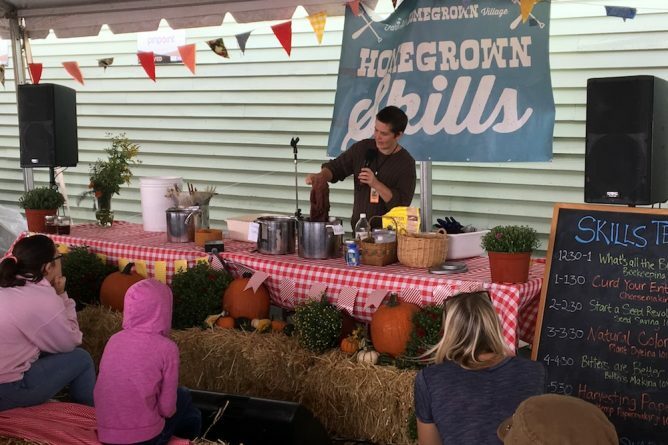 It turns out that Farm Aid isn’t just a concert, it’s a day-long festival celebrating family farms and local agriculture. The festival has a huge focus on education. 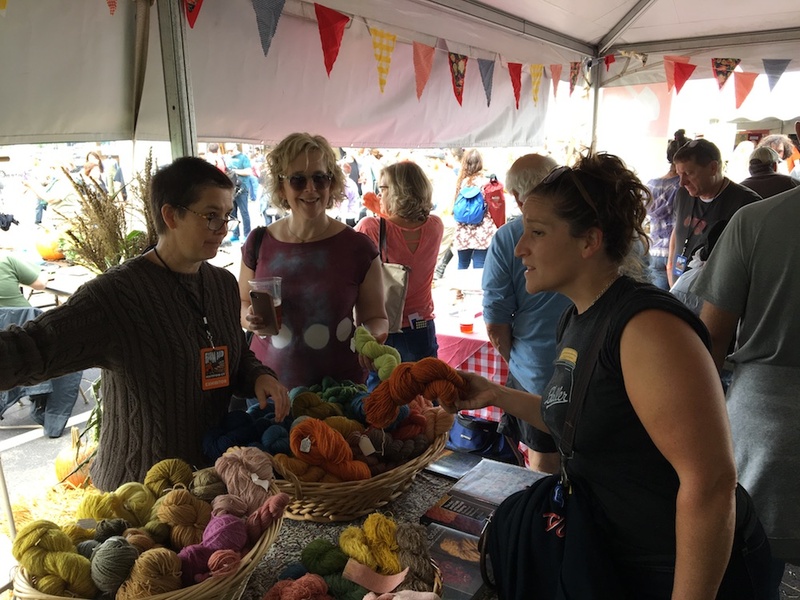 My table was in an area called the Homegrown Village, featuring dozens of organizations with creative, informative, interactive exhibits and activities. 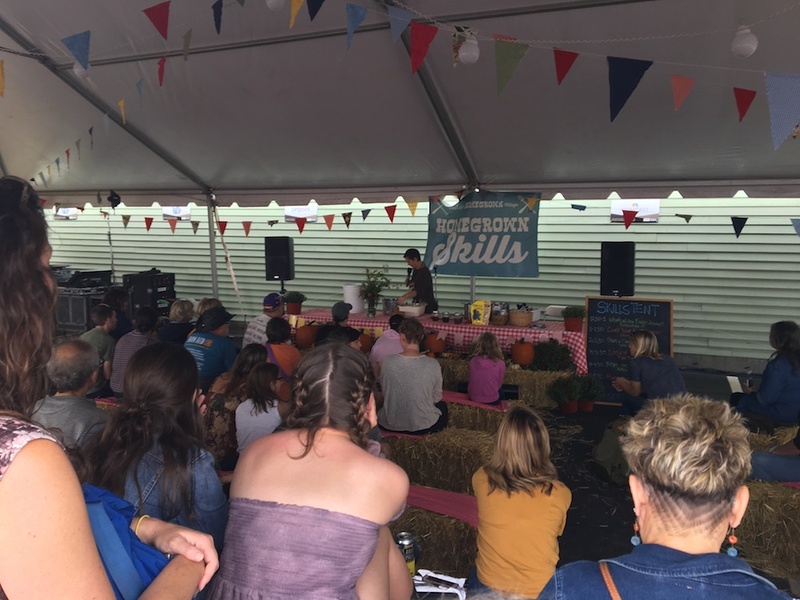 I was in the Homegrown Skills Tent, along with cheesemakers, beekeepers, papermakers, seed savers, and herbalists: a very interesting crowd! It was a big thrill to be part of it. And I mean “big” literally. Despite the boggling complexity of logistics involved in pulling off such a huge event, everyone was incredibly friendly and helpful. 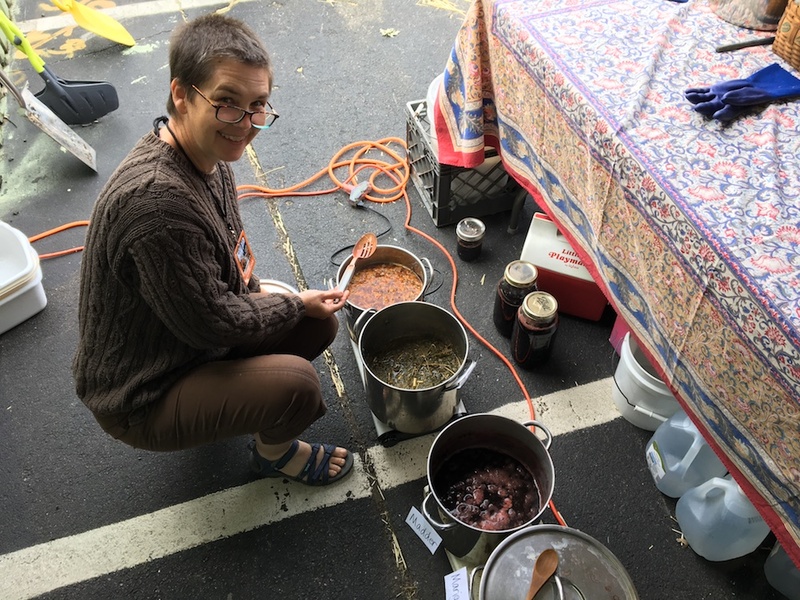 I owe many thanks to the electricians who hooked me up with power to run my electric stoves, and then rescued our extension cords at the end of the day, to the volunteers who helped us unload and pack up, and to the person who was coordinating our whole area, Jessica Kurn. Thanks to everyone’s hard work and positive attitudes, it was a really fun day. To read more about Farm Aid’s mission and projects, you can check out their website. Even though I had been aware of Farm Aid since they first started in the mid 1980s, I didn’t really know that much about the details of their work. So, it was inspiring to be at the festival and learn more about what they do. Before the Homegrown Skills Tent was open to the public, I had the opportunity to attend part of the press conference. There was a wide range of folks on stage, including many of the Farm Aid musical artists. There were also lots of farmers, and the agricultural commissioner of Connecticut. The first short video that they showed was about the struggles facing small dairy farmers. I’d seen Forgotten Farms when it screened at Amherst Cinema in 2016, so I knew a little about the financial challenges facing dairy farmers. The Farm Aid video was very moving, and highlighted some of the incredibly difficult personal experiences of dairy families, including depression and suicide of family members. I wish I could have seen more of the press conference, but even the brief glimpse that I caught helped me appreciate the significance of Farm Aid’s support for farming families across the country. OK, so what exactly was I doing there? I’d been invited to do a dyeing demonstration! 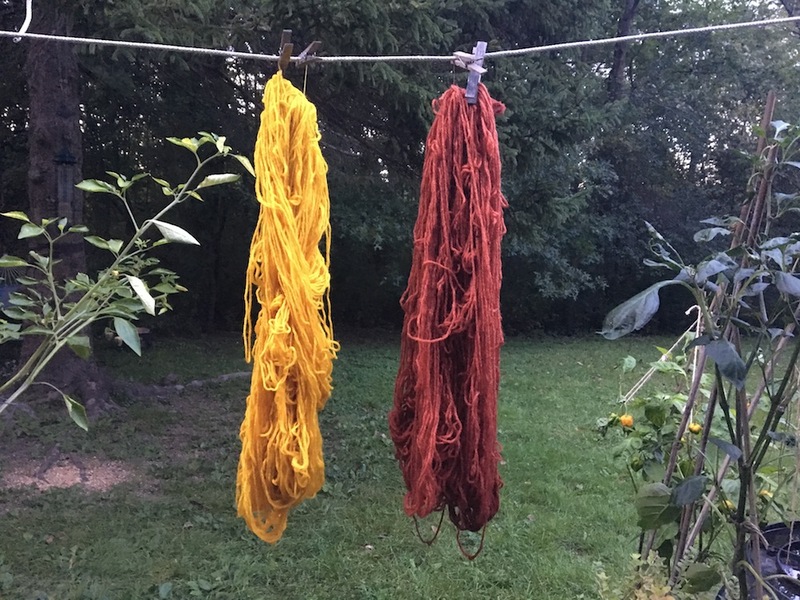 I decided to run four dye baths that day with orange cosmos, marigolds, weld, and madder. I figured many people would be familiar with marigolds and cosmos, but not too many would have heard of weld or madder. Matthew even figured out how to make one of those square-shaped puzzle-looking things that lets you link straight to my website if you have the right kind of reader on your phone. I felt very 21st century! I brought two baskets of yarn showing colors that can be obtained from plants you can gather along the side of the road or in the woods, including tansy, goldenrod, Queen Anne’s Lace, curly dock, purple loosestrife, nettles, black-eyed Susan, yellow wood sorrel, black walnut hulls, and umbilicate lichen. That’s the basket closest to me in the photo, with the yellows, grays and pinks, and the basket on the far side of the table with all the different shades of brown. I brought a big basket of colors from plants you have to grow in a garden, including Japanese indigo, woad, weld, orange cosmos, marigolds, and madder. That’s the basket on the right above. 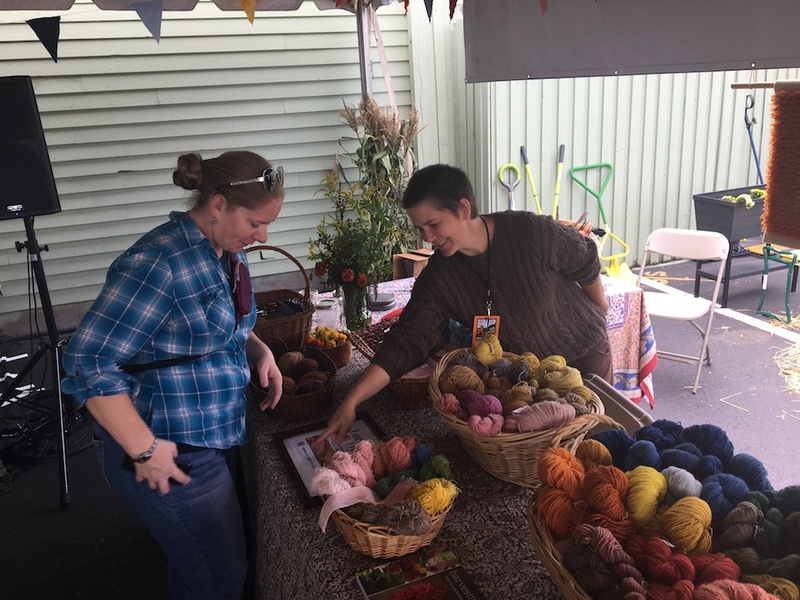 I also showed a couple types of animal fibers (different breeds of wool and alpaca) and various plant fibers (linen, cotton, bamboo, and tencel) so people could see how different fibers take the dye differently. 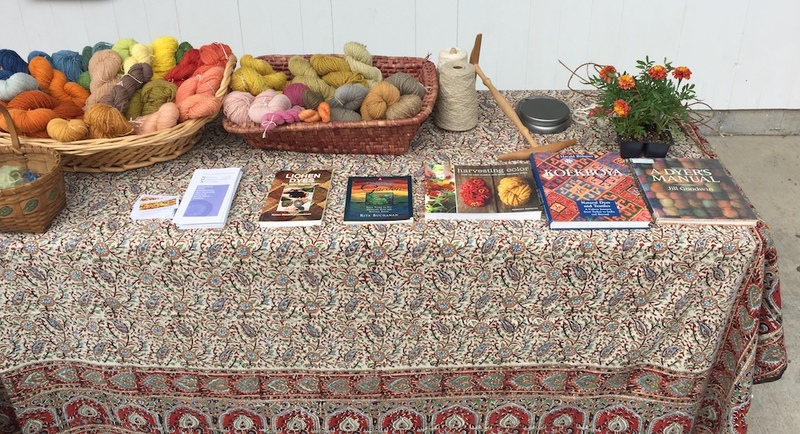 I also brought four of my favorite dye books: A Dyer’s Garden by Rita Buchanan, Harvesting Color by Rebecca Burgess, The Art and Craft of Natural Dyeing by Jim Liles, and A Dyer’s Manual by Jill Goodwin. Knitters and other fiber people always love to handle the skeins. 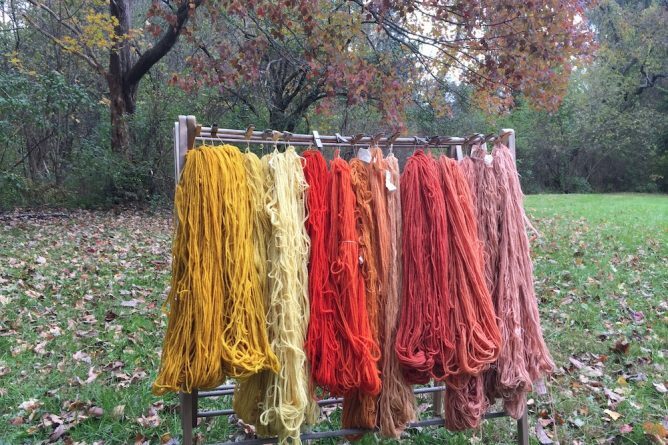 Since the whole point of a demo is to get people excited about the possibilities of dyeing with plants, I encouraged people to feel the different textures of the fibers. Over the course of the afternoon I heated and extracted the plant material to make the dye baths. My demo was from 12-5:30, so there was enough time to extract the weld twice. I had set the madder roots to soak on Thursday, and extracted them once on Friday evening. I saved that dye bath and extracted the roots again on Saturday, then combined the two extractions to make the dye bath for the demo. 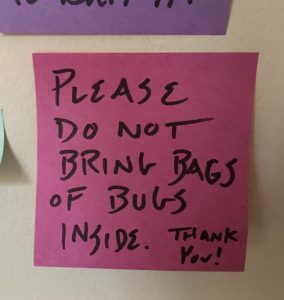 With so much going on, I had to label the pots or I was worried I’d do something dumb. I had already made a mistake with the madder when I was running around trying to pack up the van on Friday. I got distracted, and the bath almost got up to a boil, ~200 degrees. I usually try to keep my madder below 160 or so, and I was worried that I’d wrecked it. It turned out fine, thank goodness. I really love doing demos, but the only downside is that when I get talking with people, I forget to check the temperature or set the timer. At 3:00 I had a 30 minute speaking slot. 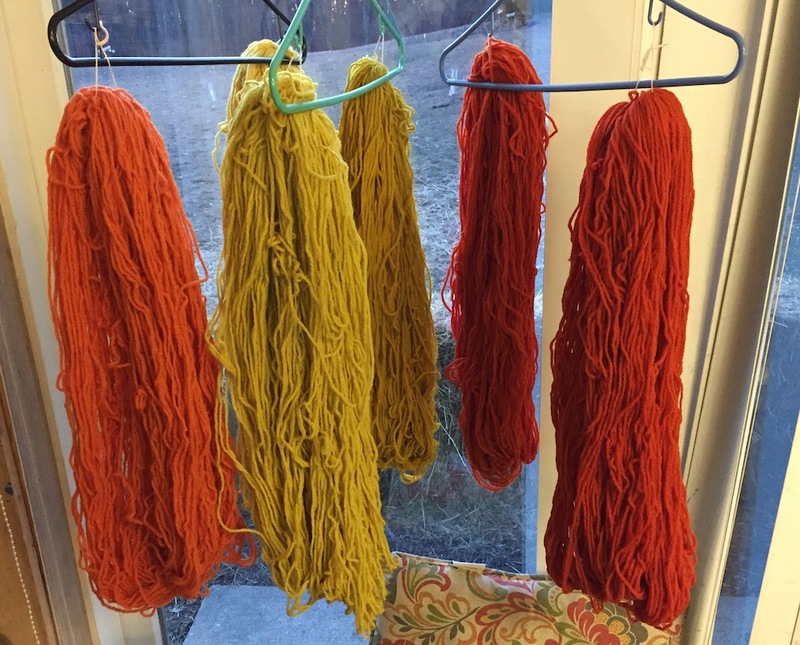 I decided to put the skeins into the dye baths while the audience was watching, so they could see the color strike. 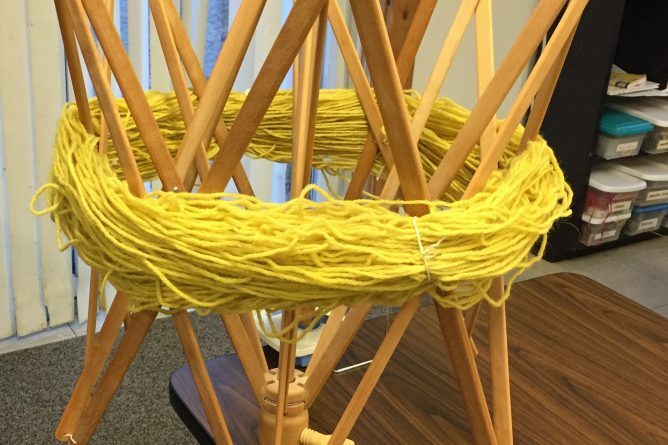 For this demo, all the skeins were 4-ply wool pre-mordanted with alum at a rate of 1 tablespoon per 4 oz. of wool and cream of tartar at 1 teaspoon per 4 oz. Each skein was approximately 4 oz. This is what my set-up looked like during my talk. 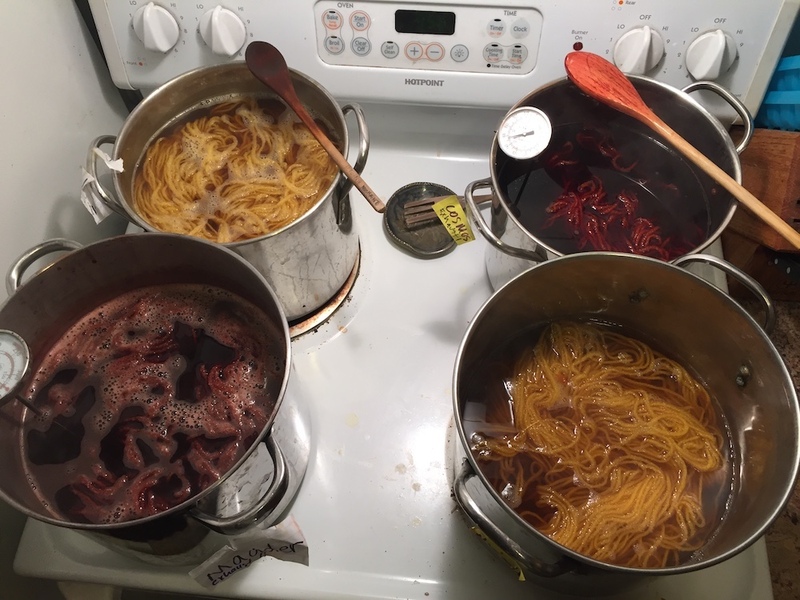 I tried to cover scouring, mordanting, and making a dye bath using a basic simmering-in-water method. 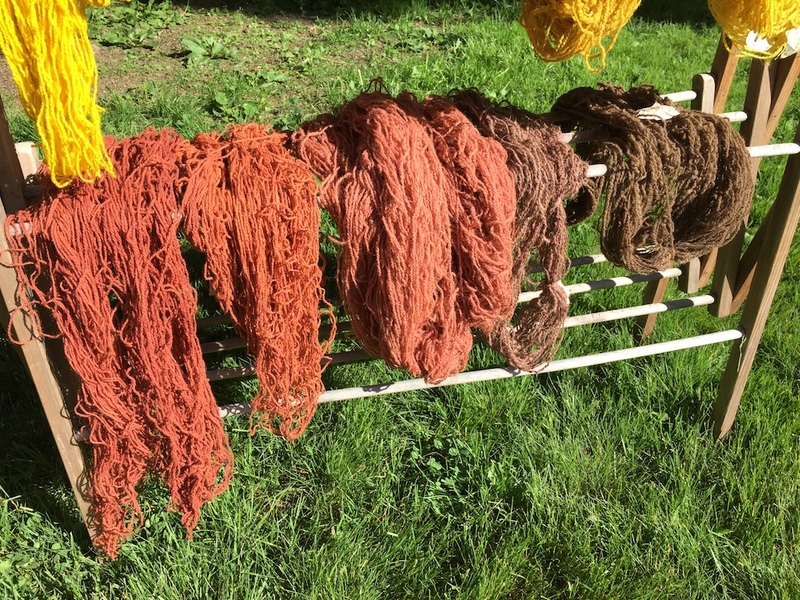 I brought up some jars with the dye bath liquid in them to pass around so folks could get a closer look, small skeins to touch, and some dried weld and madder root for people to look at, since I figured those would be new to most people. I wanted to be sure to show and explain some of the chemicals I use, like aluminum sulfate, soda ash, and calcium carbonate, which I remembered to do, but I realized afterwards I forgot to show the pH strips, scale, and other important supplies. Ah well. Questions from the audience included how to make blue with plants that grow in New England, and whether I had taken classes to learn what I know or had taught myself. The first was easy to answer and the second was trickier. I talked about Japanese indigo and woad as the two sources of blue for our region, if you want to grow your own plants. In terms of my training, I have been fortunate over the years to have taken workshops with amazing teachers, beginning with Christine White (author of Uniquely Felt), and continuing with Michele Wipplinger, Kathy Hattori, Gasali Adeyemo, Jane Woodhouse, and Joan Morris. I have consulted with many other dyers and read many books and articles. 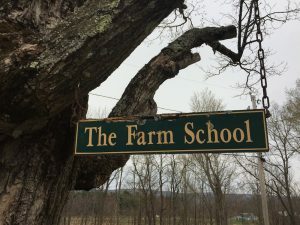 But my favorite guiding principle is still this quote from Jill Goodman: “Prove everything by your own efforts.” In the moment, I could only think to highlight Long Ridge Farm in Westmoreland, NH, where I’ve taken many classes, but I should also have mentioned Snow Farm in Williamsburg, MA. 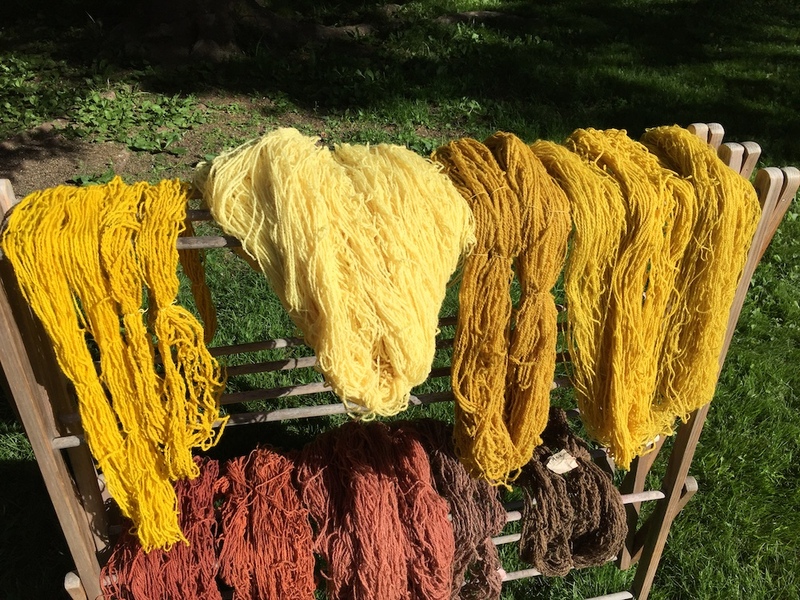 As things wound down in the later afternoon, I decided not to put the dye baths with the skeins in them back onto the stoves to heat up. Instead, I let everything cool down so it would be easier to pack up and transport at the end of the day. So, the skeins steeped for a couple hours, then sat overnight in ziplock bags until I could heat them up for a full hour the next day. I am still exhausting the dye baths, and will post again when all the skeins are done. Meanwhile, this image of the first weld and madder skeins drying on Saturday night will give you a sense of how things turned out. Vivid! 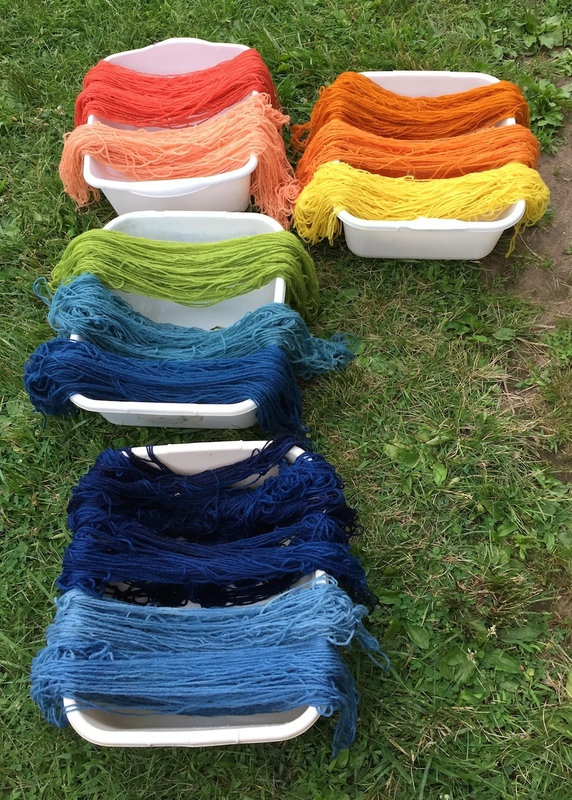 On Memorial Day Weekend I did a dyeing demonstration at Massachusetts Sheep and Woolcraft Fair in Cummington, MA. I’ve done demos there before, but this year was special. 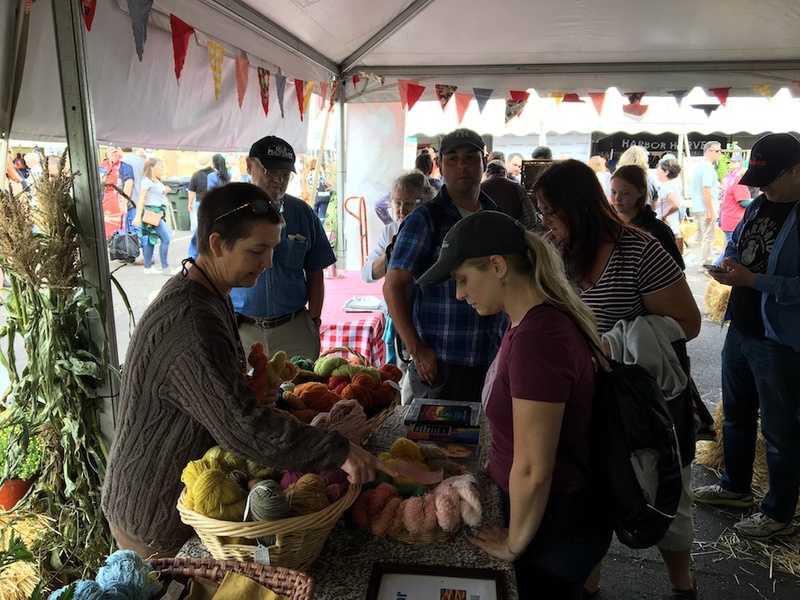 I was dyeing hand-spun yarns from a variety of sheep breeds, spun by Lisa Bertoldi of Weft Handwoven Linens, and supported by a grant from the Northeast Handspinners Association. The jar on the left contains powdered madder roots that I weighed out and soaked in water the day before. The other dye plants I used that day were weld, marigolds, and black walnut hulls. I scoured and mordanted all the skeins ahead of time using aluminum sulfate. I transported them damp, and kept them in a tub of water to pull out and use as the day went along. In addition to Lisa’s skeins, which weighed about 13 ounces all together, I had prepped some mini-skeins from Green Mountain Spinnery in Vermont (from their end-of-the-run stash) and some natural colored wool yarn from Bartlett Yarns in Maine (a very light gray-brown). 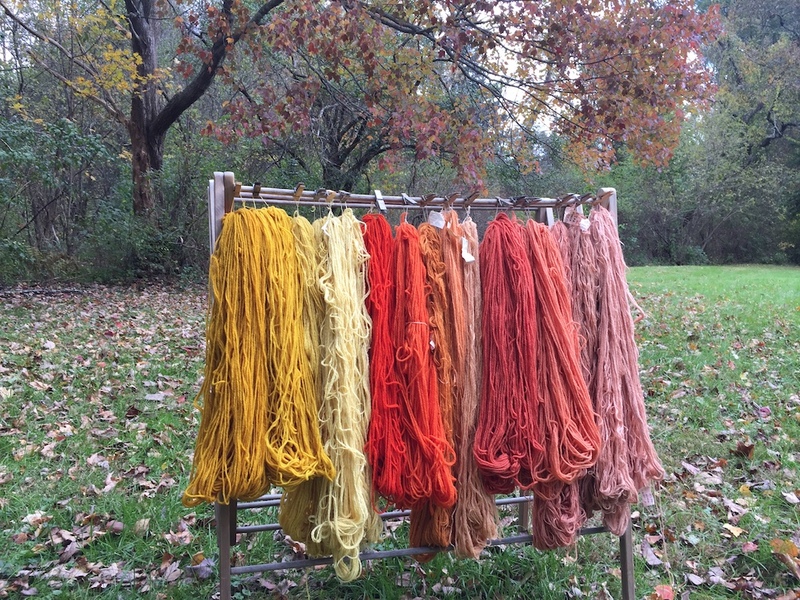 Since my demo ran all day this year, I had plenty of time to make the dyebaths as well as dye the yarns. 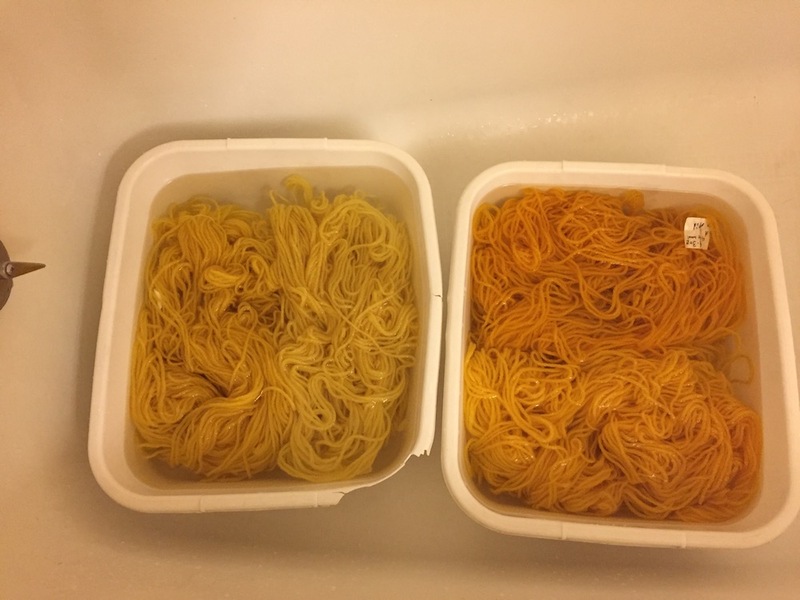 In each case, the dye plants heated in the dye pots for approximately an hour, then I let them cool off a little before straining out the plant material and putting in the yarn. Usually I like to let the fiber cool and soak overnight, but in this case I wanted to keep the process moving along fairly quickly. Once the crowds arrived I took no pictures whatsoever! It was a busy day with lots of curious visitors, great questions and conversations, and a couple unexpected but pleasant surprises regarding color. Some of the skeins that Lisa had spun were naturally colored browns and grays. I felt a little bad dyeing them, since they were already very lovely. But, that’s what I had to work with, so I just went for it. Some of the visitors came back multiple times during the day to check on the progress of the dyebaths, and I was able to get suggestions from them about which skeins to try in which pots. One young visitor was especially engaged and came back several times. At the end of the day, I let that young person pick the ones they liked the best. Hence, I do not have photos of those skeins (a madder skein and a weld skein). The day before the demo, I weighed 3 ounces of powdered madder root from Dharma Trading and soaked it in plain tap water overnight in a tall glass jar. The day of the demo, I poured the whole jar into a pot with some additional water, heated it to 150 degrees F, and maintained that temperature for an hour. Because the powder was very fine, it was hard to strain. The remaining dyebath was still a little sludgy. I added 1/2 a teaspoon of calcium carbonate and a glug of soda ash solution.The pH was 11, which is much higher than I was going for. So, I added more water and brought the pH down to 9. It also cooled off the bath a little. In the first, strongest madder dyebath, I dyed a charcoal gray skein, at the suggestion of the young visitor I mentioned. The color turned out to be a very interesting shade of purple! I wish I had a photo of that one, and it’s an experiment worth repeating. The charcoal gray skein weighed about 2 ounces. That first bath heated for an hour, around 150 degrees. Next, I put in two of the tiny Green Mountain Spinnery wind-offs (approx. 1 oz. each). The first exhaust bath heated for an hour. Alas, it got busy and I wasn’t watching the pots carefully. The first exhaust bath overheated and got up to a boil, but the color stayed pink nevertheless. 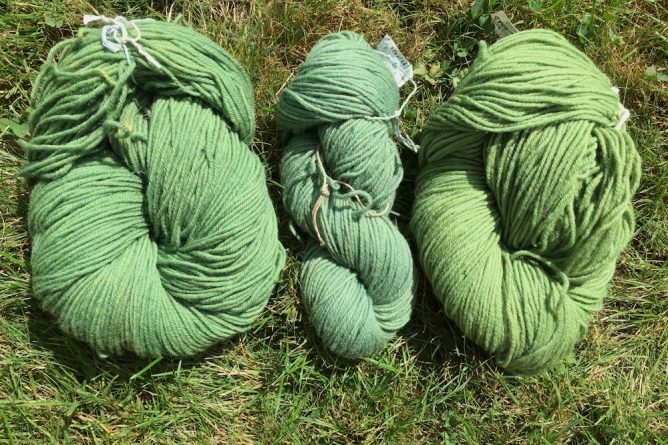 After the hour was up, I pulled those two out, and put in two more tiny Green Mountain skeins, plus a 4 oz. Bartlett skein. I heated them for 30 minutes. At this point I added another of Lisa’s handspun skeins to the pot, a 1 oz. gray-brown skein. All the skeins stayed in the pot together for another 30 minutes, then I turned the heat off and pulled it off the burner to cool. Back at home the next day, I finished exhausting the madder dyebath using another 4. oz skein of Bartlett’s. Before adding the wool, I added a little more soda ash solution and a half teaspoon calcium carbonate to get the pH back up to 9. I heated the pot to 140 degrees, and maintained that for an hour. For the weld bath I used 7 ounces of dried weld (whole tops, including stalks, leaves and flowers). Normally I would soak this ahead of time, too, but for the demo I weighed out the plant material while people were watching, and only extracted it once. After the pot got up to about 150 degrees, it heated for hour. I only cooled it a little before straining. Then we added calcium carbonate and soda ash solution to get pH9, and I put in two of Lisa’s handspun skeins (total weight about 2 1/2 ounces). They heated for an hour. It was a very strong bath and we got vivid yellows! One of Lisa’s white handspun skein weighing about 2 ounces went into the first weld exhaust bath. It was also bright but not quite so neon-electric as the first two. That skein also went home with the young person who was very excited and engaged with the whole process. Back at home a couple days later, I exhausted the weld bath. It was pH 7, so I added half a teaspoon of calcium carbonate and some dissolved soda ash to get the bath to pH 9. Then I dyed a 6 oz. skein of my own handspun, mordanted with aluminum sulfate. I used 4 oz. of dried marigold flowers, all types of colors mixed together. People often ask me whether different colors of marigold give different shades of yellow or gold. I don’t actually know because I’ve never bothered to separate them. My hunch is that they all give basically the same color, but it might be worth it to test this out sometime. The procedure for making the dyebath was the same as the weld, but I didn’t add any pH modifiers or other amendments. The first skein to go in the bath was a 6 oz. skein of Lisa’s. The skein heated about an hour, and turned a rich old gold color. In the marigold exhaust I put in two of the Green Mountain wind-offs, total weight just over 2 oz. They also yielded an old gold shade, but a little bit brighter. You can see the marigold-dyed skeins on the top right hand side of the drying rack above. I used 3 oz. of dried black walnut hulls for this demo. I usually use them fresh, and I wasn’t quite sure how dark of a bath this would give. The answer is, not very. I also only extracted them once: I brought the hulls and water up to about 150 degrees (could have been hotter, but that takes longer), held that for an hour, then strained out the hulls. In this short amount if time they probably didn’t have enough time to really soak and release their dye. Nevertheless, the result was interesting. I used one of Lisa’s light brown skeins, about 2 oz., with a lot of gray. I didn’t think to take a “before” picture, but what happened was that the walnut shifted the grayer, cooler tone of the original skein to a warmer more yellow tone. You can see the skein in the image above, on the far right of the bottom rack with the madder dyed yarns. The pinkish-brown skein from madder exhaust is next to it. The weld exhaust looks so pale in this lighting, when in actuality it’s much brighter. 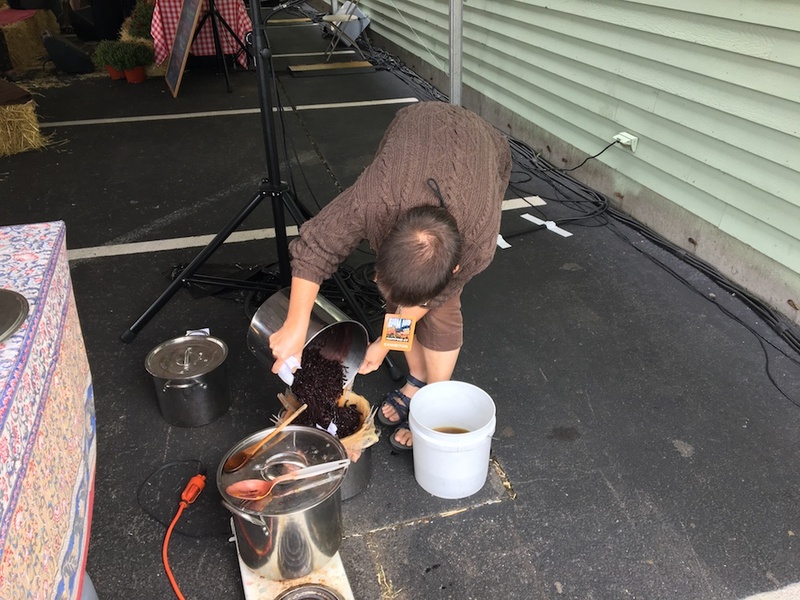 In this post I will describe more details about the dyebaths we made at the Inside-Outside Conference in Keene on October 21st. We ran four dyebaths with madder root, marigolds, weld, and orange cosmos. As usual when I am running or leading an event, I didn’t get any photos. Hopefully the notes provided here will be useful even if they are lacking in visual information. 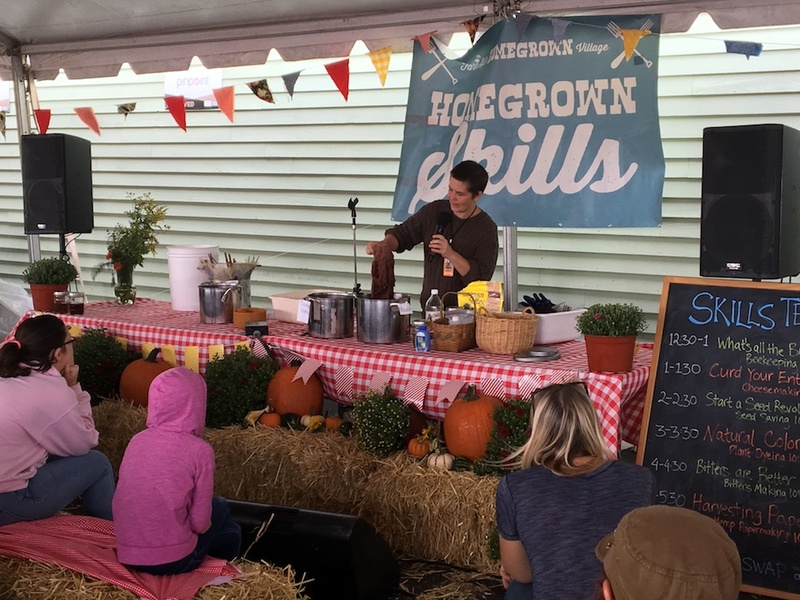 On October 21st, 2017 I presented a workshop on growing and using dye plants with kids at the Inside-Outside Conference in Keene, NH. The conference was a collaboration of several local organizations, including Antioch University New England, the Monadnock Region Placed-Based Education Committee, the Harris Center for Conservation Education, the Caterpillar Lab, Symonds Elementary School (where the conference was held), and the Keene School District. The theme was “Promising Practices in Nature- and Place-Based Elementary Education.” You can view the full brochure here. This has been an extremely prolific year for Queen Anne’s Lace, also known as wild carrot or Daucus carota. It is absolutely everywhere! 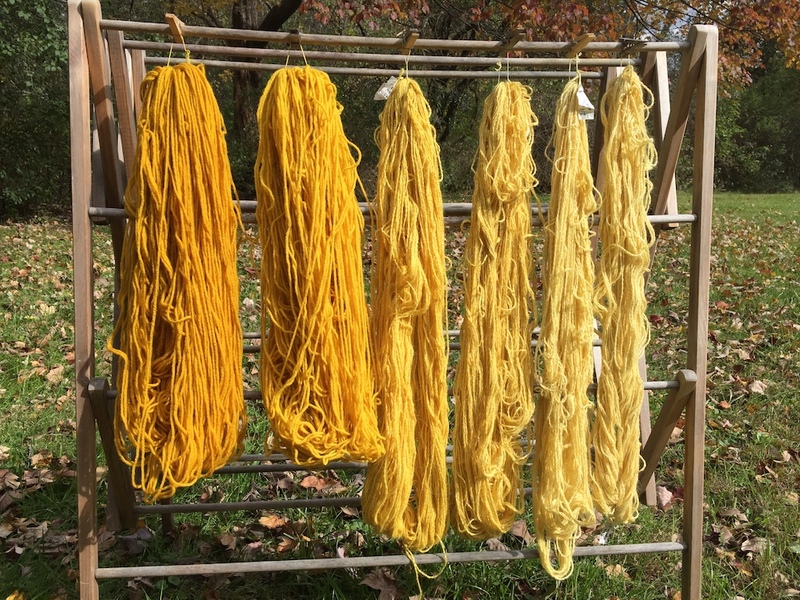 Back in July I ran two dyebaths with fresh Queen Anne’s Lace flowers. Since it’s so abundant, I decided to just use the flowers this time, though you can use the whole plant. For the first dyebath, I had no trouble collecting 30 oz. of flowers from various spots around Amherst, including the sides of parking lots, the side of the road, and next to bus stops. 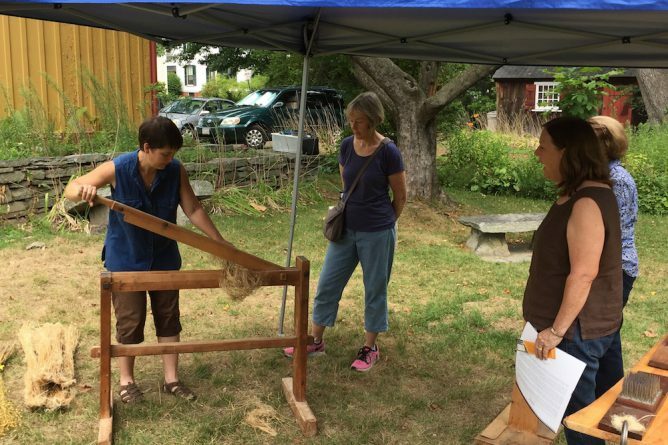 Over the past year, I have had several opportunities to demonstrate flax processing and talk about natural dyeing. Here is a quick summary of four events that I didn’t get around to writing about when they happened. I just want to document and share them before too much more time passes.